Briggs and Stratton 798339 334404 103m02 104m02, 9/10 0HV 140cc series. Laser 93377, Oregon 30-168, Rotary 14364, Snapper, MTD Yard Machines, Cub Cadet, Bolens, Remington walk behind / push lawn mower air filter. Please check air filter, to ensure correct replacement. Air filter is the first defense in maintenance, improve engine performance. When your lawnmower emit black smoke or feel tired, timely replacement is needed!Generic Model Air Cleaner: For Briggs and Stratton push lawn mower air filter 593260 798452, bs- 4247 5432 5432k, fit 500 550 625 675 725 e/ex 09p000 09p702 eco-plus 575ex series engine element. Premium Air Filter: Excellent filter paper and rubber, exact size, fit like a glove. Breathe better, run smoothly, higher gas mileage. Individually sealed, easy store. Comfortable throughout the whole season. For Troy Bilt air filter tb110 tb115 tb200 tb230 tb330 tb370, 09p702-0005-f1, 09p702-0144-f1, 093j02-0006-f1, 11a-a2bm711, 11a-a230711, 12a-a2bu711. 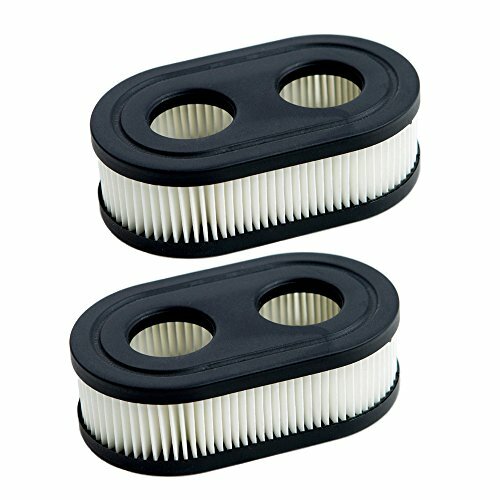 Wide Use Parts: For Stens 102-851, Toro, Husqvarna, Craftsman, Murray walk behind / push lawn mower air filter. Replace part number of small engine OEM air cleaner.